I received an email today from Pastor Benjamin Faircloth from Ignited Church in Lavonia GA. He shared a prophetic word he received in 2012, which I believe confirms what the Lord has shown me about President Obama, that he is the antichrist. The Lord didn’t call him President. He just called him Obama. He said Obama would “be a part”, which could mean he has a part in signing it in a leadership position other than President, perhaps world leader? Or perhaps as part of an antichrist coalition of leaders? As you know Temple Mount plans are ready. Pressure is building among the ultra-religious in Israel to begin construction of a new temple. Rumors and bullets are flying in Jerusalem. We are living Bible prophecy in real time! We are near the coming of the King! Pastor Benjamin’s word is similar to the prophet Daniel’s word because both connected the treaty with the temple. According to Daniel, the antichrist makes the seven-year covenant, which today would be called a treaty, but then he breaks it after three and a half years by putting a stop to offerings and sacrifices, which are offered in the temple. I believe part of the seven-year treaty will allow Israel to proceed with rebuilding their temple, but it will be a trick. They will think they are building it for their own use, but once the construction is completed the antichrist will betray them by taking it for himself to establish his throne there (Matthew 24:15). He seeks to exalt himself to be like the Most High, ruling from Mount Zion as God (Isaiah 14:13-14). 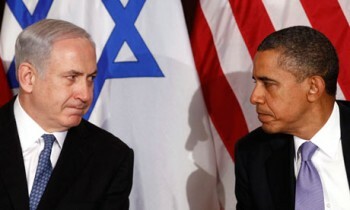 Although Pastor Benjamin saw Israeli Prime Minister Benjamin Netanyahu would have a part in rebuilding the third temple in Jerusalem, I believe he won’t be able to proceed until the treaty is signed, which means Obama would also have an important role in this, which would be a confirmation of what I shared in my previous post, Obama to Facilitate Construction of Third Temple in Jerusalem. Pastor Benjamin’s word also confirms a word received by Melissa Peggs in 2008, which I shared in my previous post, Melissa Peggs: Obama Signs Seven Year Peace Treaty. I’m sure the word was a false deceptive word . Obama was fooled into thinking he would be the world leader. He will not be the world leader. All obama is is the red rider! Since he has come into office war has broken out in many places all over the globe. And now we are on the verge of WW3. No Obama is not the Antichrist but only one of the riders who has almost completed his job. This “prophecy” did not happen. But God is still the “I AM!” Praise God! Many Bible prophecies recorded thousands of years ago remain unfulfilled today, including most of the book of Revelation, but they’re still just as valid and as accurate as ever. I like a quote a heard, “The prophetic is like the rodeo. You have to hold on for more than 8 seconds.” I believe this prophecy about Obama being part of signing the peace treaty remains just as accurate as ever. I also wasted many years, but better late than never! How many terms can an Israeli Prime Minister serve? I read your website every day and have been doing so for many months already. I like what you are doing; bringing the visions and dreams of modern day prophets to the attention of the modern world. What if the Lord is speaking about different things at the same time in Daniel 9:27? What if (yes) the he who makes a “firm” covenant with the many (the world/his coalition/his enemies) = the antichrist. The period is for “one week” – being 7 years. In the middle of the “week” he puts a stop to sacrifice and grain offering (we know this to be the daily “Tamid” offering – morning and afternoon). So the anti-christ (through whatever means) gets this practice to stop after three and a half years. The one who makes desolate is the one who received the spirit of antichrist, the one known as the son of perdition. Perdition means loss and destruction. The son of perdition brings destruction wherever he goes, which is just the opposite of the true Messiah who brings blessings wherever he goes. There are two different spirits bringing two different results. James Bailey: Did you ever finish your ebook on the tribe of Dan? If so, can you post a link or direct me to where the link is located? Thank you! I finished most of my research and wrote a lot, but I am now planning to include it as part of another book about the antichrist. This blog has been taking all of my time lately, so the book is delayed. Obama, next UN secretary general? Hey James, I Think you are right, I thought for a long time he was not , but the more i research it & the way he can charm ,manipulate, lie, is unreal. Just look at what all he has done. Yet he seems to be untouchable & unstoppable. no other President ever could have gotten away with half of all he has done. If he somehow gets a third term then there will be no question in my mind. James, I like your site alot and I read your updates almost daily. Like Daniel, I don’t think Obama is the antichrist. John Paul Jackson in one of his webcasts said the antichrist is extremely good looking with model looks, speaks so eloquently, is half Jew and half Arab but believes in neither Christianity nor Islam, and is from Europe somewhere. And he said at the time he was shown who he was, he was about 30 years old (probably imitating how old Jesus was when He started his ministry). And JPJ said to pray for Obama, even though he’s not godly, but for the safety of the people of America. Yes I agree, Ken Peters also said that he will be very handsome and loved by everyone. It cant be Obama. Obama is here to take the peace from the earth. Thanks for your comments. You might not realize Obama fits many of the criteria you listed. The idea of physical attraction is not found anywhere in the scriptures, but it does say the antichrist is empowered by the devil to accomplish what he does. Obama’s name is all Arabic. Barack means blessed and Hussein means handsome in Arabic. The Lord revealed to one of our visitors Obama’s lineage traces back to Lebanon. His mother was Jewish from the tribe of Dan as documented by research done by JR Church. Researchers have found evidence that the man who Obama claims to be his father might not be his real father. Regarding his religion, surely Obama is not a believer in any religion because his aim is to exalt himself as god. He plays both sides, Christian and Muslim, for his own advantage. Ultimately, each of us must seek the Lord for revelation about the identity of the antichrist rather than relying on anyone else to tell us. When I did that I was surprised by what he showed me. I have documented my dreams and visions on this site, and have received over 100 confirmations. Hi, I’m confused by your reply. I don’t get what the Jewish ancestry has to do with the Antichrist. The False Prophet will be of Jewish decent it’s true but the Antichrist will be of Assyrian decent. See Isaiah 10:24 14:24 Micah 5:5,6 KJV or NKJV to name a few. Note: “The Assyrian” in the passages is incorrectly translated as “The Assyrians” in many of the modern translations (NASB NIV) but it is masculine singular in the original Greek ie “The Assyrian”. I’m not a fan of the KJV but it has it right in this case. Also people will often say that the Assyrian invasion of Israel already happened in times of old but in fact it is a double prophecy and it needs to be pointed out the the first time Assyria took over Israel it did not capture Judah but when the Assyrian Antichrist comes around the next time it will be. While on the subject of the Antichrist I don’t see how Obama can be him as you stated. He is pretty obviously in the wrong ethnic group and from the wrong region of the world (not Assyrian). I would say though that he does typify what the Antichrist will be like and how people will react to him when he shows up. The Jewish ancestry of the antichrist comes from the scriptures regarding the tribe of Dan. Obama is from the tribe of Dan. The antichrist is also called the Assyrian, but it does not say his ancestry is Assyrian, but that he will rule over area. Either way, Obama qualifies because his ancestry goes back to Lebanon, which was part of Assyria, and I believe he will eventually rise to power in that same area. These points also disprove your claim that Obama is from the wrong ethnic group. Beyond that, the Lord revealed to me and many others that he is the one. You didn’t give any scripture references for claiming that the antichrist is from the tribe of Dan. I would appreciate it if you would post those. Also I’m a little skeptical about the ancestry research you mentioned. Perhaps you can point me to where that info is. Lastly there is much more I could have posted regarding this but after some consideration I realize that it would probably not convince anyone anyway so I wish you the best and we will just have to agree … to disagree. In the end, time will tell. Just wanted to touch base one last time before you wasted any time looking up and posting the scripture references I asked about. I’m glad you were too busy to get to that because I no longer need that info. I was able to find a few videos on youtube from the late JR Church that answered my questions. I still disagree but it’s not important in the grand scheme of things. There is nothing anyone can do to prevent the “ac” from rising to power when the time comes. Oh I almost forgot. Hussein is Arabic for “good”, “handsome” or “beautiful” but Barack is actually African for “blessed” (and not Arabic as you stated above). I started to reply to your previous post but then I realized it was too long for a comment so I was going to post a new article and link to it. Then I got so fascinated by the topic because I kept learning more about the tribe of Dan. At first I was going to share it as an interesting theory about the ancestry of the antichrist, but after finding so many convincing scriptures I believe it really is true. What was going to be an article has turned into an ebook, which I will offer as a free download. I hope to finish it in another week or two. I had been meaning to reply to your previous comment just to let you know a reply was coming. In any case, thanks for raising this question because it has been very educational for me and I believe it will also help many others too. I believe it is important because it provides more evidence regarding the identity of the antichrist. Satan plans to use this man to lead multitudes into hell but God is exposing the dark schemes of the evil one so that many people can be rescued before it is too late. The Muslims believe that their messiah/prophet/12 imam/mahdi or whatever, has to be a direct descendant of Mohammed. They would not accept another as their messiah. Unless it can be proved that Obama is descended from Mohammed, then he will not be accepted. Also with his support of gays and other abominations, he is not following the Quran’s teachings as homosexuality is against their laws. Who knows but perhaps some deception will be made to convince the Muslim world, but it seems very unlikely. Perhaps he is the antichrist but he doesn’t appear to be their promised mahdi.